Nusajaya is a regional city, located west of Johor, Malaysia. IskandarInvestment.com says: "Just under half of the entire Nusajaya landbank is being developed by UEM Land Berhad, a wholly owned subsidiary of UEM Land Holdings Berhad." Puteri Harbour is a marina development that spans 687 acres (2.8 km²) on the Straits of Johor, with a view over the island of Singapore. This waterfront precinct is still under development (June 2013), and houses a functioning marina, a ferry terminal with expensive and infrequent services to the Harbourfront area of Singapore (90 minutes away). There is currently much development and speculation in the area. A commercial development is open, and a marina-front pedestrian area with restaurants is open. 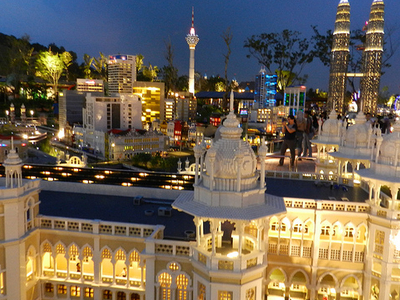 It is close to JSNAC and a short drive away to LegoLand and other new attractions in Nusajaya. Three theme parks are located within this zone including, Legoland Malaysia, Puteri Harbour Family Theme Park that include Hello Kitty Town (first outside Japan), Little Big Club & Lat's Place. Here's the our members favorite photos of "Cities in Johor". Upload your photo of Nusajaya!